The wonder and simple joy of creativity never fails to amaze me. 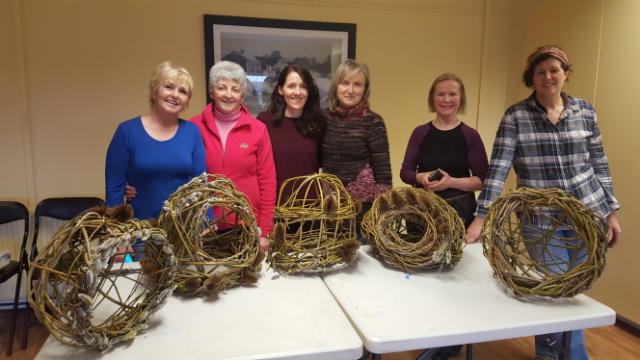 I had the pleasure of returning to do a willow workshop with a lovely group of people in Blackrock, Co. Louth. It’s always a treat to visit this award winning park and see what new projects are being undertaken by the Gardening Committee and the Tidy Towns group. The children’s garden has been a new addition since my last visit. The outdoor classroom is getting lots of use by St Francis’s National School. It’s heart-warming to see what can be achieved when a dynamic, hardworking group of people with a vision come together. The energy to do the ongoing work in Blackrock Park is very definitely born from a desire to make the area a better place for everyone in the community, while also encouraging wildlife and biodiversity into the heart of the town. We had planned to make large willow chairs for the park but when the Irish weather came into play, the decision was taken to create wonderful vessels to add to the beauty of the park. Everyone had the same materials to use, yet everyone still managed to put their own personality and style into their creative vessel. The vessels are suspended from the trees within the park, with plans for features to be added to the vessels, as the seasons change. You never know, the big willow chairs might also be in the park by summer time!